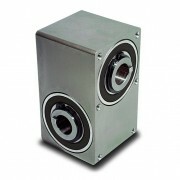 We can offer several different Right Angel Gearboxes from Zero-Max and Tol-O-Matic. Crown right angle gear drives are compact, reliable spiral bevel gear drives designed for a dependable, economical transfer of speed or power. These drives are constructed of high quality materials to help ensure maximum service life with a minimum of maintenance. They are compact and sealed from outside contaminants to provide smooth, quiet operation, even in harsh industrial environments. Crown right angle gear drives are available in numerous standard models which include two and three-way versions and in 1:1 and 2:1 speed ratios. 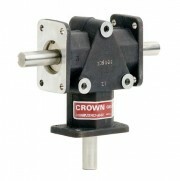 Standard Crown models are designed to meet a wide range of torque and shaft speed requirements. Special units can be designed to your specifications with shaft extensions, special machining of shafts or case modifications. Tol-O-Matic's Float-A-Shaft "floats" on rotating shafts. No other design has the versatility, durability, safety, or the ease of operation as the Float-A-Shaft. Float-A-Shaft is a universal right angle gear drive coupling. It consists of two 45° helical gears that mesh at right angles, designed to turn power around any corner. Float-A-Shaft can be operated in either direction and can slide axially along the drive or driven shaft. A lightweight aluminum housing encloses the gears, serving as a structural support and a lubricant reservoir. The gears mount directly on the shafts through keyways in the gears and shafts. These rugged and durable hardened helical gears have been field-proven for over 35 years, assuring dependable operation. Float-A-Shaft's unique floating design maintains perfect alignment. It also eliminates dangerous chain sprocket drives and the additional adjustments required for chain drive applications. Float-A-Shafts are available in either a low torque journal bearing series or a high torque sealed roller bearing series. Maximum speed on these units is 500RPM. The Slide-Rite™, like the classic Float-A-Shaft, is a universal right angle gearbox. 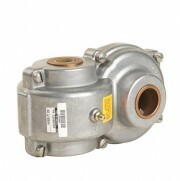 It consists of two 45° helical gears that mesh at right angles, designed to turn power around any corner. The Slide-Rite™ Gearbox can be operated in either direction and can slide axially along the drive or driven shaft. Its unique floating design maintains perfect shaft alignment allowing for easy installation. A solid one-piece aluminium housing seals the gears from outside contaminates, providing for smooth operation in even the harshest industrial environments. The CR Model is the latest in the Slide-Rite™ range. It is corrosion resistant with all components being made in aluminium, stainless steel, or nickle plated steel.